I have really enjoyed making this mixed media mosaic today. I wanted to make something impressionistic, capturing a mood and atmosphere. I did not want to use grout, so the spaces between the tiles and the driftwood played a part in the movement of the piece. I painted the board first in light blue, and then chose the pieces of driftwood which reflected the movement of the waves. 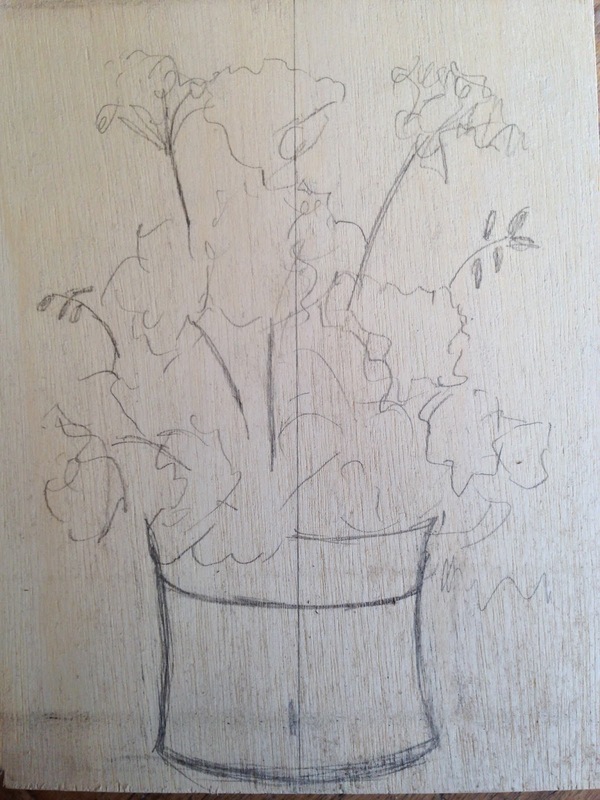 I arranged them on the blue board, stuck them and then varnished them with matt varnish to protect the driftwood. When all was dry, I chose three shades of blue tile and snipped wave shapes, and started to fit them in, from light blue to the mid, then darker blue. It was tricky to accommodate the driftwood shapes, but I'm really pleased with how it turned out! 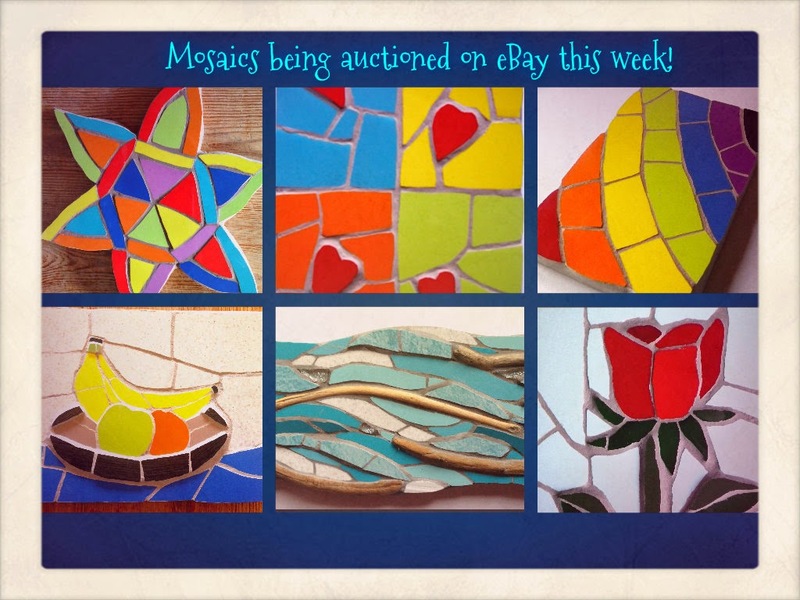 It is now up for auction on eBay, if you fancy owning a piece of original mosaic art! Just a quick note to give you the heads up about what is being auctioned in my eBay shop this week - have a look if you have a mo! A mosaic clown fish commission to share with you..! 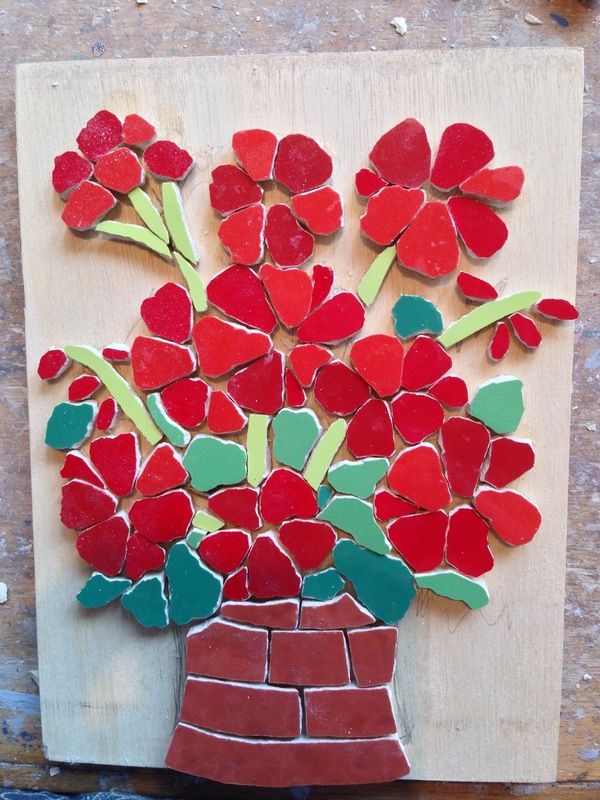 Much as I love to make lots of flower mosaics for Mother's Day here in the UK, it has been lovely to make something different today - just thought I would share it with you. I was commissioned to make this clown fish mosaic for a chap's 50th birthday - yes, he loves them!! This one doesnt move, but he is wonderfully textural and 3D, and I am rather pleased with him! 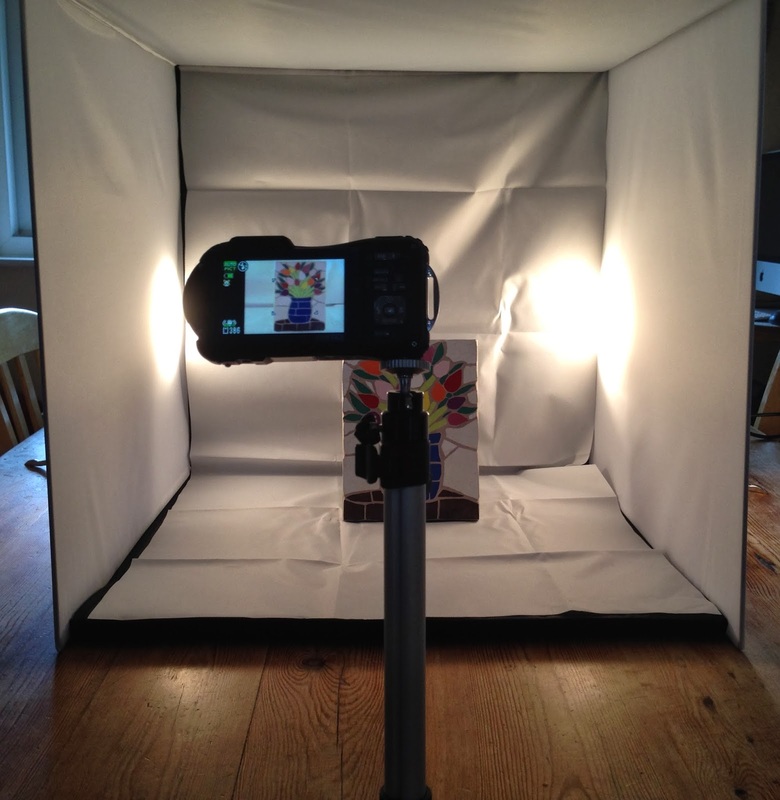 Photographing art - a beginner starts her journey! One of the great and challenging things about running your own business is that you have to become a jack of all trades! So one of my New Year's resolutions was to get better at photographing my work - giving as true as possible representation of what it would be like to have it in your hands. This is particularly important for my mosaics as they are so 3D and textural. I didin't want to pay someone to do it for me - for lots of reasons. Obviously its not cheap as you are paying for a professional's time and equipment, also I often make something and want to post it straight away to see how it goes down - I'm patient with snipping but not quite so with other things! I basically wanted to learn the skill myself too. So after a lot of Googling and reading, I set about it and this is how I am getting on. 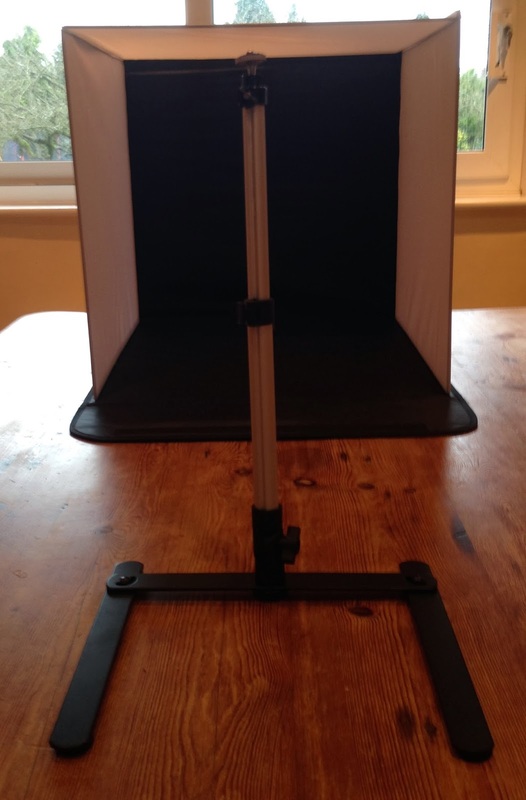 I took pictures for you along the way as I gradually set it up, talking to myself along the way - here they are! 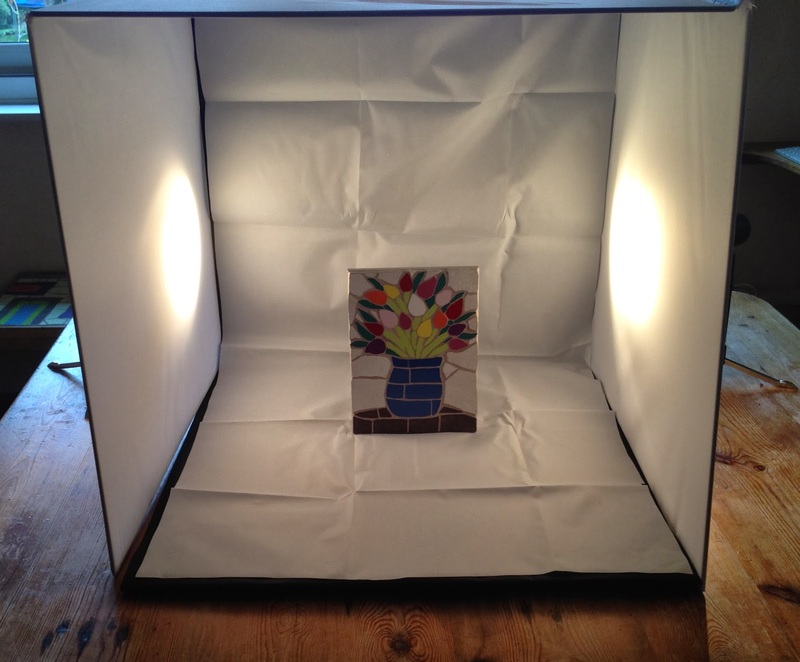 The foldable photo box - this one is 50cm x 50cm to accommodate my bigger mosaics - well, that was easy! Then the two dear little lamps which I had been told get very hot, so be warned! I wasn't sure what this was for - refer to instructions, Felicity! 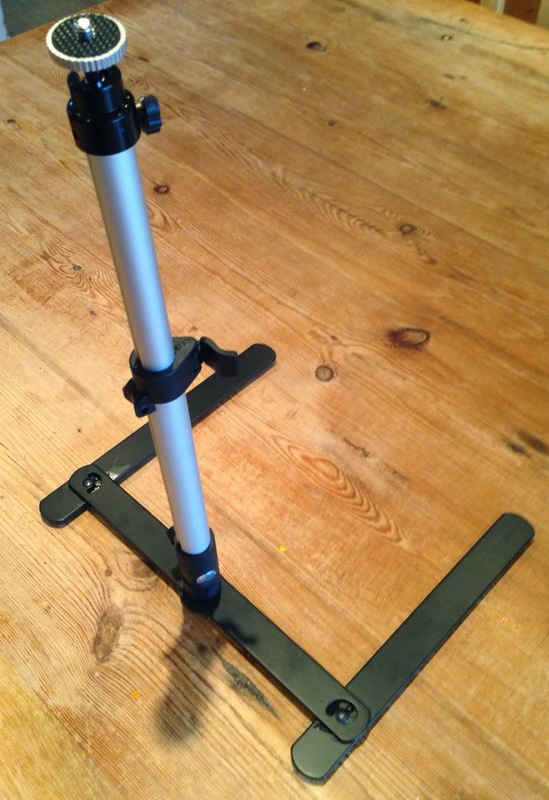 Screw camera onto tripod, get angle as you want it and... action!! I tried all sorts of camera settings, light positions and so on - making a note of each one, as I knew I would never remember which one was which. Then I downloaded them onto my computer, made a coffee and had a good look! Some were awful, most OK, some not bad at all! At the moment, I think my best combo is Flower mode and Auto Macro mode on the camera, and lamps pointing at the mosaic (outside the photo box) - but it's early days!! ....comparing it to this one, I just snapped, with the same camera but no new kit! I definitely prefer it, but know I've got a long way to go - am enjoying the journey! Thanks for reading and any advice from you budding photographers out there, always gratefully received! 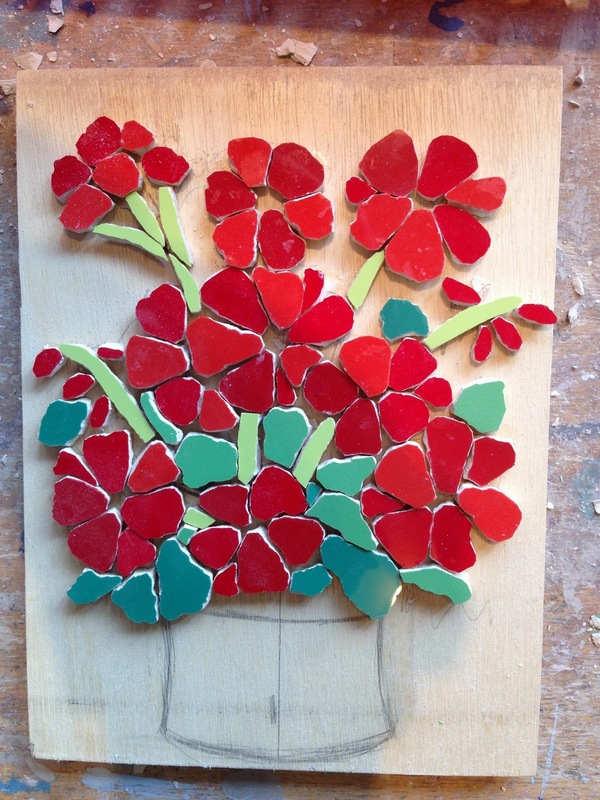 My new, better-than-ever, made-over blog about mosaics and beyond..! I have spent so long fiddling around with my new look blog that I have just got to share it will you - the dog isn't that interested! I wanted to give my mosaic-and-beyond blog a little make over and freshen things up a bit. Humour me - this is what I've done! So, new modern font, but not too whacky, a new header photo and title font, lots of exciting new things in the side tabs for you to click on, including my new source of chocolate money - Adsense! Folksy has a new widget too which shows you my latest work, but, of course there is loads more in my shop for you to have a look at. I'm not allowed to show you lovely lot any more for some reason, so, my noble band of followers, you are in my thoughts but just not in the side column! There are a few new colour combos and text size - I'm told these things matter! - up-to-date links, and a lovely shiny new Google+ button, if you should feel so inclined! Enough, enough - I hear you say - we can see for ourselves, Felicity! Feedback would be great - go on, do take a mo, and leave me a comment! My old Dad always used to say, that we are like performing seals and need a fish from time to time! Thank you! Now I MUST get back to snipping - laters! PS If anyone can tell me how I change the titles' font in the side bar I would very grateful - can't spend anymore time on it - aaaarrggghhh!! I just wanted to share with you an unusual and poignant commission I have just finished. The mother of a customer sadly died a year ago, and to mark her 1st anniversary, my customer wanted me to make a mosaic of her Mum's favourite flowers - snowdrops - to be near her Mum all year round. Forgive my little plug, blog friends! 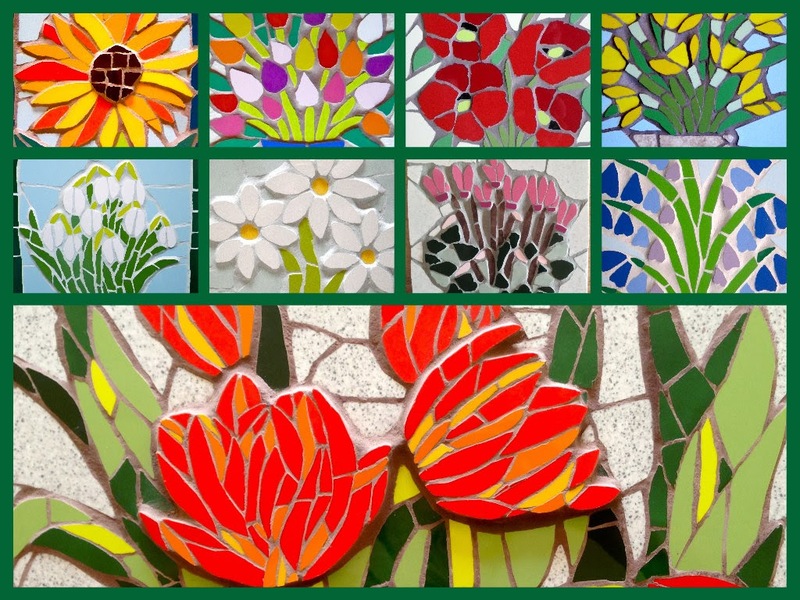 Here in the UK, Mother's Day is on March 30th and my flower mosaics cost the same or even less than a bouquet of flowers - and my mosaics last forever!! So, do take a look in my Folksy shop and see if anything catches your eye - and if your Mum's (or yours!) 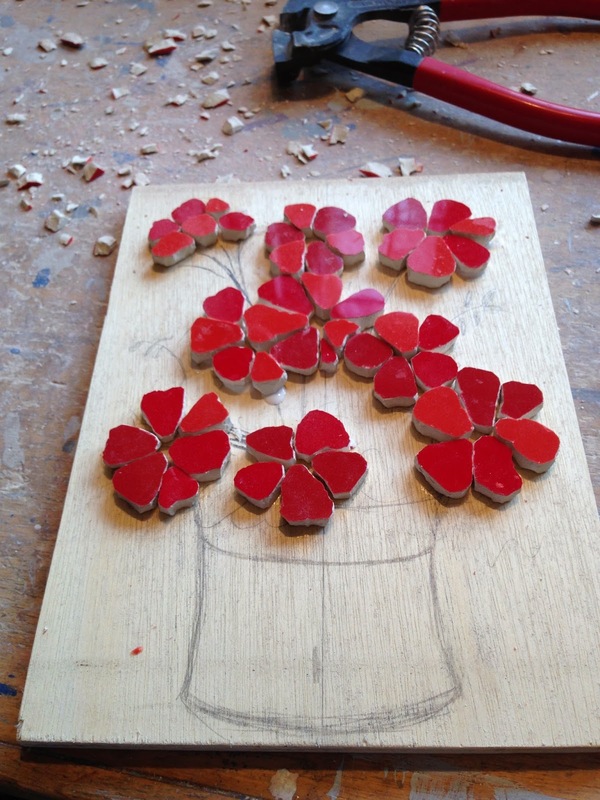 favourite flower isn't there, I will do my best to oblige - I love making new mosaics! As always, I am happy to ship overseas, but it does cost a little more, so perhaps you could send me an email to sort it out. I would really appreciate you showing them a bit of Google love and sharing, if you like them!